The Broncos' Super Bowl XXXIII ring is 25 percent heavier than its predecessor. Each ring has a 14-karat yellow gold band and contains 120 diamonds, totaling 4.04 karats. 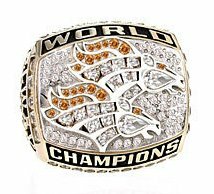 It's comprised of two Broncos horse-head logos, two Lombardi trophies--with a marquis diamond in each-- on one side, and "Back2Back" engraved on the other.